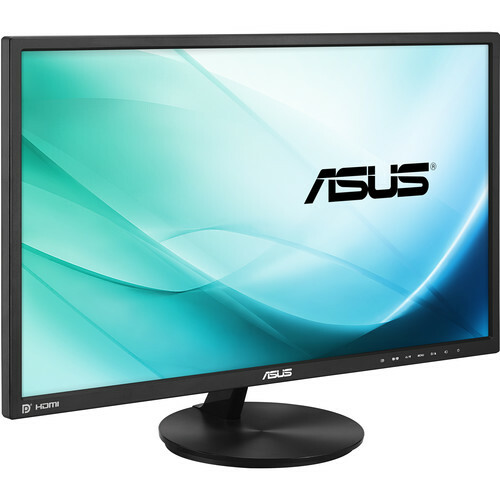 Display content at up to Full HD 1080p (1920 x 1080) resolution using the VN248Q-P 23.8" IPS LED-Backlit Display from ASUS. The VN248Q-P features a compact design with a narrow bezel of just 0.4", which when combined with its VESA wall mount compatibility, has the capability to be used as a multi-screen display solution. The VN248Q-P features In-Plane Switching (IPS) Technology, LED backlighting, a screen size of 23.8", a widescreen 16:9 aspect ratio, an ASUS Smart Contrast Ratio of 80,000,000:1, 250 cd/m2 brightness, and a 5 ms (gray to gray) response time. Using viewing angles of 178° and tilt angles of -5 to 20°, it is possible to watch content from varying positions. The display also features strong color reproduction with 16.7 million colors and has 1 x DisplayPort 1.2, 1 x HDMI, and 1 x VGA (D-Sub) inputs. For multimedia performance and playback, this display also features 1 x 3.5mm line-in jack, 1 x 3.5mm earphone jack, and dual 2W stereo RMS speakers, and two low blue light modes. Included with this display are a VGA cable, an audio cable, and a power cord. Box Dimensions (LxWxH) 29.0 x 17.0 x 17.0"
VN248Q-P 23.8" IPS LED-Backlit Display is rated 4.2 out of 5 by 5. Rated 5 out of 5 by William W. from It's a Keeper!! This is a relatively new monitor and there are not many reviews for it so I took a chance with it and all I can say is I am glad I did.It has wonderful accurate color and sharpness great viewing range the preset modes are very effective at enhancing different viewing needs you could want and if not of course you can easily tweak it to suit your specific needs, I should also mention the computer it is hooked up too is Windows 10 64x, graphics hardware NVidia GTX 960 set to full dynamic range (my preference) and hooked up via DisplayPort alongside another 1080p screen via HDMI Powering it up was easy just plugged in the DisplayPort turned it on and Windows automatically set it to extend desktops.I had some apprehension after reading another review regarding text not displaying correctly however I felt that there were other factors involved with that review other than the monitor being at fault depending on your hardware you may have to do some tweaking . With my setup did not really have to do anything, reviews I read from other verified purchasers mentioned no problem with text at all. Being a longtime fan of various other ASUS products I know they have high quality standards and that ultimately was the real deciding factor in my purchase, The 3 Year Warranty and ASUS Rapid Replacement with 2 way free shipping helped as well of course, rebate is certainly a plus also.I did go through ClearType text tuner as I usually do and the defaults worked well the text is very sharp for 1080p at normal viewing distance no color aberration bleeding or blurring of small close kerned fonts at all I am entirely happy with the way text looks on it.If you are going to be working with a lot of text setting it in reading mode makes it easy on the eyes the contrast is very pleasant after your eyes adjust to it as with the other modes, the view modes can be set without going into the menu of course by second button from the left.The control button layout was a little odd at first compared to my other monitors but I quickly got used to it and appreciate the effectiveness of the layout, the icons are on the front the actual buttons are on the back.The power light is white red when off it faces down so there is no irritating right in the eye glare the edge of it can be seen without distracting.The bezel is a matte finish as is the screen it is 1.3 centimeters wide on the sides and top.The speakers are not entirely useless for casual listening needs (16bit 48khz HDCP no compressed formats) they are okay not irritating and tinny sounding just a bit hollow, of course if you are not to concerned about sound they should be fine. With DisplayPort or HDMI you don't need the audio cable but may need to tweak audio settings especially if you have more than one monitor with speakers, with Windows the sound automatically defaults to the primary monitor, it does have headphone jack. Did I mention it comes with all the cables you need to hook it up, HDMI, DisplayPort 6 footer, VGA, Audio and of course standard 3 prong power cable. Nice Looking at the base and its small footprint you may think it would not be stable an tip over that is not the case however the post that connects the base to the unit itself flexes a bit while making adjustments, I personally have no problem with it and was expecting for that to be the case all I can say is it really does not matter it is negligible at least to for me and won't take points away for it, desk mount clamps or wall mounting are an option and would open up even more desk space of course.I know this monitor will serve me well whether it be video or photo editing (Photoshop looks great on it as does Excel) or just watching a movie maybe playing a game, at 5ms response it is certainly fast enough for any AAA game and is very good for IPS monitor.I usually don't write reviews for things I buy but this is my first IPS monitor and I really like it and would definitely recommend to family and friends as a good all-around monitor at a great price. Rated 5 out of 5 by Wendel75 from Excellent monitor Very happy with my purchase of this monitor in fact I bought 3 to upgrade my sim racing rig and WOW these monitors look and perform very well they are being run by a 1070 graphics card on high settings and no ghosting and great graphics straight out of the box also they came with all the cables you need for each connection type 3 in all and are 6ft in length the description doesn't list DisplayPort cables but they did come with. Would for sure recommend this monitor to anyone looking for a good gaming or photo editing monitor or whatever else you might need it for. Rated 5 out of 5 by William W. from It's a Keeper!! This is a relatively new monitor and there are not many reviews for it so I took a chance with it and all I can say is I am glad I did. It has wonderful accurate color and sharpness great viewing range the preset modes are very effective at enhancing different viewing needs you could want and if not of course you can easily tweak it to suit your specific needs, I should also mention the computer it is hooked up too is Windows 10 64x, graphics hardware NVidia GTX 960 set to full dynamic range (my preference) and hooked up via DisplayPort alongside another 1080p screen via HDMI Powering it up was easy just plugged in the DisplayPort turned it on and Windows automatically set it to extend desktops. I had some apprehension after reading another review regarding text not displaying correctly however I felt that there were other factors involved with that review other than the monitor being at fault depending on your hardware you may have to do some tweaking . With my setup did not really have to do anything, reviews I read from other verified purchasers mentioned no problem with text at all. Being a longtime fan of various other ASUS products I know they have high quality standards and that ultimately was the real deciding factor in my purchase, The 3 Year Warranty and ASUS Rapid Replacement with 2 way free shipping helped as well of course, rebate is certainly a plus also. I did go through ClearType text tuner as I usually do and the defaults worked well the text is very sharp for 1080p at normal viewing distance no color aberration bleeding or blurring of small close kerned fonts at all I am entirely happy with the way text looks on it. If you are going to be working with a lot of text setting it in reading mode makes it easy on the eyes the contrast is very pleasant after your eyes adjust to it as with the other modes, the view modes can be set without going into the menu of course by second button from the left. The control button layout was a little odd at first compared to my other monitors but I quickly got used to it and appreciate the effectiveness of the layout, the icons are on the front the actual buttons are on the back. The power light is white it faces down so there is no irritating right in the eye glare the edge of it can be seen without distracting and because it is facing down it acts as a dim light source directly under it. The bezel is a matte finish as is the screen it is 1.3 centimeters wide on the sides and top. The speakers are not entirely useless for casual listening needs (16bit 48khz HDCP no compressed formats) they are okay not irritating and tinny sounding just a bit hollow, of course if you are not to concerned about sound they should be fine. With DisplayPort or HDMI you don't need the audio cable but may need to tweak audio settings especially if you have more than one monitor with speakers, with Windows the sound automatically defaults to the primary monitor, it does have headphone jack. Did I mention it comes with all the cables you need to hook it up, HDMI, DisplayPort 6 footer, VGA, Audio and of course standard 3 prong power cable. Nice Looking at the base and its small footprint you may think it would not be stable an tip over that is not the case however the post that connects the base to the unit itself flexes a bit while making adjustments, I personally have no problem with it and was expecting for that to be the case all I can say is it really does not matter it is negligible at least to for me and won't take points away for it, desk mount clamps or wall mounting are an option and would open up even more desk space of course. I know this monitor will serve me well whether it be video or photo editing (Photoshop looks great on it as does Excel) or just watching a movie maybe playing a game at 5ms response it is certainly fast enough for that and is actually really good for and IPS. I usually don't write reviews for things I buy but this is my first IPS monitor and I really like it and would definitely recommend to family and friends as a good all-around monitor at a great price. I should also mention B&H expedited shipping is fantastic I live in the Boston area and got it the next day!! Rated 4 out of 5 by Jortak from Nice monitor for the money It is a fantastic monitor for gaming only problem is some words sometimes seem a little pixelated other than that brilliant. Rated 2 out of 5 by JCowell from Not for a 2015 15 The physical construction of this monitor is spectacular. It is built well and looks like a high quality product. All cabling was included with this monitor, HDMI, DisplayPort 1.2, VGA (D-Sub) and 3.5 mm for speakers. I purchased two of these to use as external monitors for a 2015 Apple Powerbook 15. Unboxing them I was confident and excited for my new dual monitor set up as the quality was apparent. When I got all connected and turned my system on the graphics were beautiful. All satisfaction stopped when i opened a spreadsheet, then a word document and then a couple of text based websites. This is the worst monitor I've ever seen for viewing text. Text is fuzzy and very pixellated. I contacted B&H and chose to call ASUS direct who referred me to Apple IT as they blamed my graphics card. After 2 1/2 hours of phone calls I pugged an older HP 2711x into my system and saw that text was clear there and could no longer blame Apple. I have 2/12 hours of phone time and probably another hour or more invested in changing settings and options on my own prior to making the tech calls. After doing some research I chose to reorder from B&H two new Dell U2414H and return these two ASUS. Reading reviews I'm hoping the Dell's do not disappoint. I spent about 24 hours attempting to read blurry text from these monitors and my eyes are exhausted. I'm going to pack them up and send them back ... (another hour of my time unpacking and repackaging...Ugh...) I would definitely not recommend these as external monitors for Mac Laptops. Does this monitor have 2 HDMI ports? This monitor has only 1 HDMI port.